Introduction: Earlier this year, in a “Search for One” spirited review, we took a look at new kid on the rack Denali’s Jadewood 843WJ, a stick in their entry level series. Naturally, there’s more to this manufacturer than this one line, and today, we turn our attention to the other end of the spectrum for a look at their top end Noirwood series. 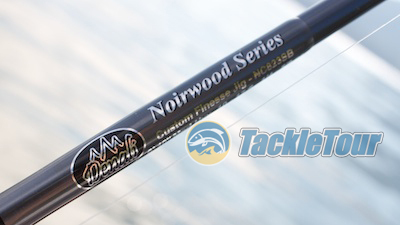 Presenting our review of Denali’s top end finesse jigging stick, the Noirwood N823FJ. Impressions: Denali is one of the few rod manufacturers leveraging guides from a company other than Fuji. Their company of choice? Alps - a Taiwanese company that's been building rod components since 1985. Featured on the Noirwood series are the ALPS Light XN guides built with stainless steel frames and ceramic inserts. A visit to the ALPS website reveals the frames of the XN guides are contoured intentionally for tangle free performance and the inserts are pressed in deep to mitigate against damage and pop outs. The reelseat of our N823FJ is made by Forecast and is a familiar, blank through design. Capping off the reelseat on top, is the signature wooden foregrip by Denali, who this time makes use of a dark, ebony colored wood hence the series' name of Noirwood. The rear split grip is made of a textured carbon fiber material. 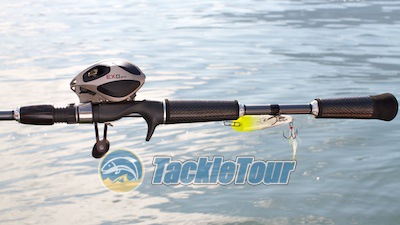 Overall the rod's black and silver color scheme is very fitting. 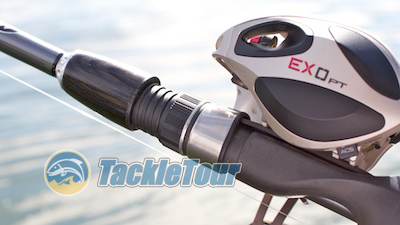 Field Tests: I paired the Noirwood N823FJ with a Quantum EXO PTi casting reel spooled on different occasions with either braid or fluorocarbon using it primarily at Clear Lake, California through a variety of applications. 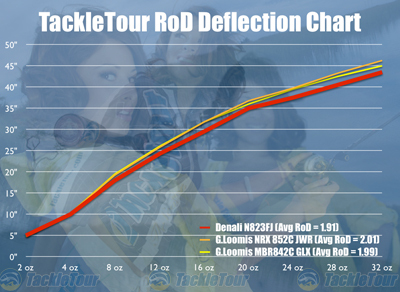 Fig 1 : The above chart illustrates the deflection characteristics of the Denali N823FJ (red) versus two "2" powered sticks from G.Loomis. The N823FJ is labeled as "medium heavy" by the manufacturer, but by our estimation, "medium" is a more appropriate classification for this stick. Casting: The N823FJ is rated by the manufacturer as a "medium heavy" powered rod, but it shares similar ratings to that of the MBR842C GLX, one of my all time favorite medium powered sticks. As such where I chose to get a feel for this stick’s casting abilities was with small jerkbaits and topwater baits. I actually had a lot of fun casting Molix’s Jubar jerkbait with this stick as it loads nicely and with it’s 6’10” length, is easy to count on for deliberate, and accurate casts. 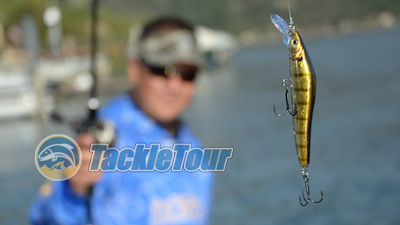 This stick makes a wonderful companion to small jerkbaits like this Molix Jubar. Sensitivity: The N823FJ, as previously mentioned, is part of Denali’s Noirwood series of rods. These sticks are built on blanks that feature a blend of forty (40) and fifty four (54) ton graphite. This should result in a very high quality blank and one that has very good sensitivity. Bottom dragging applications are not its strong suit. To test this aspect of the rod, I tied on a half ounce jig and dragged bottom in a spot on Clear Lake known for its hard, rocky bottom. 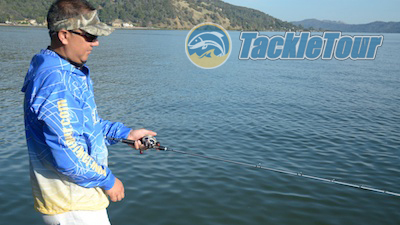 The line I was using was Seaguar’s Tatsu Fluorocarbon in twelve pound test. The results? I could certainly feel the surface, and my jig being pulled across the bottom, but there was something missing from the sensation. The N823FJ lacks that degree of crispness I come to expect from rods built of high quality blanks. The Noirwood Series is Denali's top end offering built on a blank that features a blend of 40 and 54 ton graphite. I switched reels momentarily to one that was spooled with Sufix 832 braid in fifty pound test, and naturally, this helped, but still I expected the rod to be a bit more crisp given the graphite rating of the blank. Matched nicely with a Quantum EXO PT.